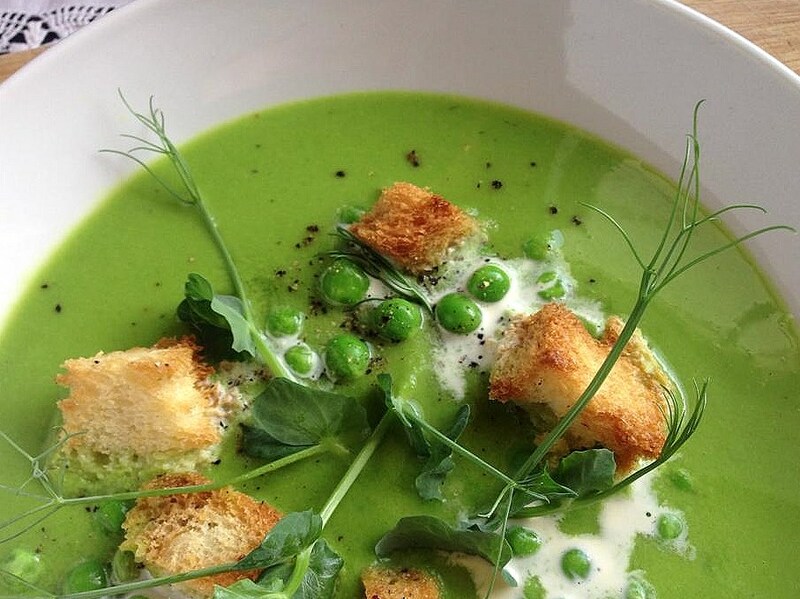 This garden pea soup one of my favourite recipes and the fact that it is so easy to make, means that it is even more appealing. You could use freshly podded peas but to be honest, frozen peas are just as good and so convenient. The sourdough croutons add a little bit of texture and along with some peas left whole give the soup substance. This is a wonderful summery soup but the fact that it uses frozen peas means that it can be made at any time of year. 1. Heat oven to 180C/Fan Oven 160C/Gas mark 4. Put the cubes of bread in a roasting pan and toss in the olive oil. Season well. 2. Place in pre-heated oven for approximately 15 minutes, giving them a toss halfway through, until golden brown. Remove from the oven and allow to cool. 1. Heat the butter in a large saucepan over a moderate heat. Add the onions and crushed garlic and fry gently for about 5 minutes until softened but not coloured. 2. Add the stock and increase the temperature until the stock is boiling. Add the peas and cook for 3-4 minutes until the peas are tender. 3. Remove from the heat. Add the mint and season generously with sea salt and freshly ground black pepper. 4. Purée the soup in batches by filling a blender/food processor one third full and puréeing until smooth. Pass through a sieve (for a super smooth soup) into a clean saucepan. 5. Check for seasoning and adjust as necessary. 1. Add the remaining frozen peas and heat the soup gently over a moderate heat but do not allow to boil or it will lose its lovely green colour.